I fell off the Final Fantasy bandwagon long ago, but thanks to all the wildly enthusiastic appraisals for it (including from my friend and yours John Teti), I’ve always had a yearning to go back and play Final Fantasy XII. To this JRPG skeptic’s surprise, it’s only taken the first hour or so of The Zodiac Age, the new PlayStation 4-exclusive remaster of FF12, to get me hooked. 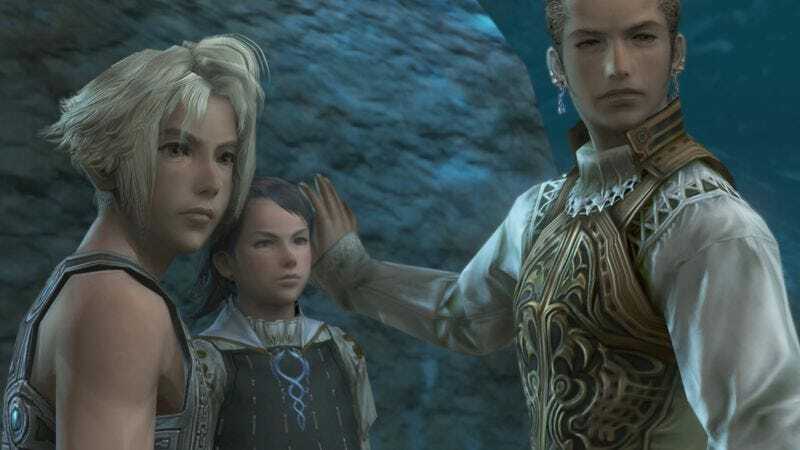 The game’s premise deserves a lot of credit for Final Fantasy XII’s early promise. It’s a typical “evil empire absorbing your sovereign nation” story, but the transition from the prologue’s royal pomp and military spectacle to the street-rat reality of your main character is a powerful one. It cuts straight to the political manipulation of Dalmasca’s new rulers and the class dynamics they introduce to the gorgeous city of Rabanastre. You’re also thrown into the game’s job system early on, forced to make a permanent decision about Vaan’s career path that will surely have some effect on shaping your play style for the dozens of hours that follow. For inexperienced players, it’s a nerve-wracking moment, but it’s also an exciting peek into how deep the strategy for your party’s customization can get. I can’t believe I’m saying this, but I’m excited to see where it all leads, and as an impatient heretic, you best believe I’ll be making liberal use of the option to double (or even quadruple) the game’s speed. I’m not good at Devil Daggers, the extremely difficult demon-shooter that briefly took the world by storm last year. If you haven’t played it, here’s how it goes: You start off standing in the center of a spotlight that, on its edges, appears to drop off into an abyss. Slowly, jagged squids bloom from the darkness, vomiting skulls at you. One hits you, and you die. You try again. This time you manage to kill one of the things that vomited the skulls, but three more had emerged in the time that it took you to do that, and you ran into one, so you die again. You continue this cycle, increasingly angry and unnerved. Your score is the amount of time you stayed alive, measured to the nearest ten-thousandth of a second. At 76.1850 seconds, I have done better than all but two of my friends on Steam. The two that have made it past the 100-second mark have come to understand some of the many complexities within the game—the shotgun blast, the double jump, the tractor beam. But they have also borne witness to the unfathomable terrors that linger there: Gigantic crepuscular bugs, soaring centipedal dragons, and hideous variations of them all. You get stronger, too, turning into a rainbow-pulsing agent of death still barely able to put up a fight against these minions of Satan. The game, developed by a small team in Australia, follows a delightful and somewhat recent trend in game design of hyper-difficult games hiding great complexity within them. Invisible Road, Super Hexagon, certain modes of Geometry Wars—these are, at first, games about merely hanging on for dear life, but eventually they reveal sets of mechanics as finely honed as a bullet-hell shooter or competitive fighting game. It is to Devil Daggers’ endless credit that it cloaks this complexity in an aesthetic of ’90s PC-shooter satanism and modern dark-ambient groans. I’m not sure I’ll ever be anything less than terrible at this game, but that’s the point. It’s an unyielding monolith, a complete thought. It is hell.